The expansion of the exhibition “Poetic Robotism: Aquatopia”: an installation made by Laura Prikule and Eva Vevere, “Navigation Track” was presented during the contemporary culture forum “White Night”, on September 10, from 7.00 p.m. till 1.00 a.m. at Kim?. Decoding the title, the installation is a visual version of gaps in the modern reality. In an interactive aquatope, created in the territory of Kim?, the viewers had to choose their own “navigation track”. Interacting with different objects from the exhibition everyone was able to reveal in sand the traces of collapsed civilizations, swimming fins, caps, memories about once transmitted Morse signals and applying the methods of Poetic Robotism ascertain that their ideas are viable. This was a nautical journey and adventure in the circumstances of changeable environment. 19.00 Kim? entrance. Briefing on navigation. Introduction to the Poetic Robotism’s principles. 19.30 Restaurant Kitchen terrace. Test of ideas’ ability to float. 20.00 1st floor gallery. 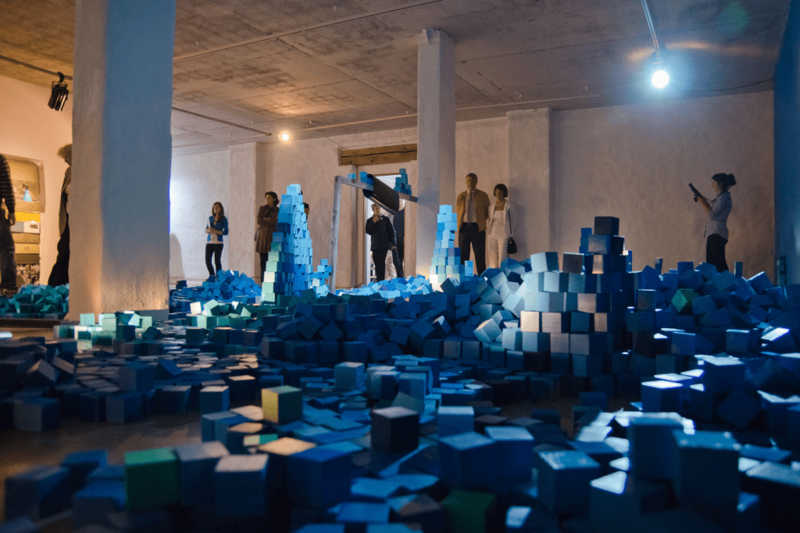 Hexahedron architecture: building a wave of cubes at the exhibition “Poetic Robotism: Aquatopia”. 21.30 Lecture room, 2nd floor. Try-on of swimming accessory collection. 22.00 Lecture room, 2nd floor. Passive installation at the ralaxation zone – image projections with water and its symbols from different parts of the world, and civilization’s manipulations with it. Video from Morse study center (library). 00.45 1st floor gallery. Destruction of the wave. Closing. Music, snacks and drinks during the whole evening at the Restaurant Kitchen, Kim? ground floor. In the other Kim? exhibition halls Honza Zamojski’s solo exhibit “Monumental Statues” and Tamara Zibner’s exhibition “Mimi’s Diary” will be open.